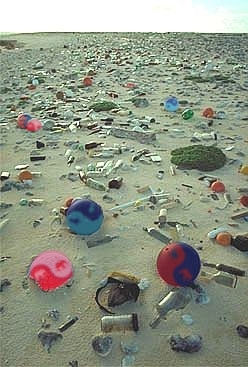 Periodically, the Dividist enjoys strolling down a metaphorical beach to take note of the divided government detritus that has washed ashore and cluttered his little island of rationality in the great big blogospheric ocean. Jonathan Haidt explains the impact of tribalism on the Framer's intent. "Here is the fine-tuned liberal democracy hypothesis: as tribal primates, human beings are unsuited for life in large, diverse secular democracies, unless you get certain settings finely adjusted to make possible the development of stable political life. This seems to be what the Founding Fathers believed. Jefferson, Madison, and the rest of those eighteenth-century deists clearly did think that designing a constitution was like designing a giant clock, a clock that might run forever if they chose the right springs and gears. So what did the Founders do? They built in safeguards against runaway factionalism, such as the division of powers among the three branches, and an elaborate series of checks and balances. But they also knew that they had to train future generations of clock mechanics. They were creating a new kind of republic, which would demand far more maturity from its citizens than was needed in nations ruled by a king or other Leviathan.. So, how are we doing, as the inheritors of the clock? Are we maintaining it well? If Madison visited Washington, D.C. today, he’d find that our government is divided into two all-consuming factions, which cut right down the middle of each of the three branches, uniting the three red half-branches against the three blue half-branches, with no branch serving the original function as he had envisioned." While we enjoyed Professor Haidt's prose, the Dividist took issue with his conclusion. The three branches do not always behave as he describes - "three red half-branches against the three blue half-branches, with no branch serving the original function." When we have divided government, when both the red and blue factions each have control of at least one branch, both red and blue factions will jealously guard the institutional protections - the "clock mechanics" - invested in their branch. They will embrace and wield the constitutional power granted to their branch under the Constitution against incursions by any other faction controlling another branch. In short, under divided government, the system is functioning exactly as envisioned and designed by the framers. The worst impulses of all factions are constrained, and federal policy is moderated. However, the dire circumstance the Professor describes can occur when one party/tribe/faction secures a unified government that controls all three branches, as we have now. In that case, there is a clear temptation for partisan loyalty to undermine the constitutional protections and institutional responsibilities so carefully designed by the founders, particularly if we foolishly elect those who do not understand or respect our institutional traditions. Lee Drutman thinks the Founders screwed it up bigly. "Certainly, we Americans tend to take great pride in our democratic institutions, and find it inconceivable that our Constitution is not perfect. But while the framers were wise and thoughtful men, they did make some mistakes. They did not anticipate political parties. They thought ambitions and loyalties would be to institutions, not to parties. But as the events of 2017 have made clear, once again, partisanship is more powerful than institutional loyalty. There is no separation of powers without divided government. It’s time to face up to this reality." Within the article, Drutman offers a simple one sentence solution to the problem saying - "For the immediate moment, anyone who believes in the importance of separation of powers should support Democrats taking back the House and the Senate in 2018." - Which is certainly true (See Objective 3). But then he immediately dismisses it saying "But this is a limited answer... After all, divided government under high partisan polarization is really just gridlocked government..." - Which is certainly false (see Mayhew - Divided We Govern). He then proceeds to offer his preferred solution: completely abandoning the Constitution in favor of a Parliamentary systems with proportional representation. Which would be frightening, if it wasn't a fantasy on the order of unicorns farting rainbows. An interesting note - Drutman not only finds replacing the Constitution with a parliamentary system to be a solution to the problem of restraining a majority Unified Republican Government in 2018, but in 2009 he also found it to be the right solution to the problem of pesky minority Republicans slowing down the efforts of a noble Unified Democratic Government in the first two years of the Obama administration. So, to net this out, it is clear to Drutman that every governance problem in our Federal government is a Republican nail, and they all can be fixed by replacing the Constitution with a new Parliamentary hammer. We've seen this affliction before. The medical term is Prog Parliament Envy. But we digress. It is too easy to point to the partisan hypocrisy of both red and blue factions as they flip to diametrically opposed positions depending on which political tribe is ascendant. But it is a fact that the problem Drutman highlights is very real and it's not new. In 2006 (coincidentally during the last Unified Republican Government) Levinson and Pildes make the exact same argument as Drutman in a Harvard Law Review article entitled "Separation of Parties not Powers". Drutman is right that a unified partisan government potentially undermines the checks, balance, separation of power and oversight responsibilities so carefully crafted into the intricate clockwork of our Constitution. But fixing it does not require throwing our constitutional baby out with the bathwater and replacing it with a new parliamentary monster. 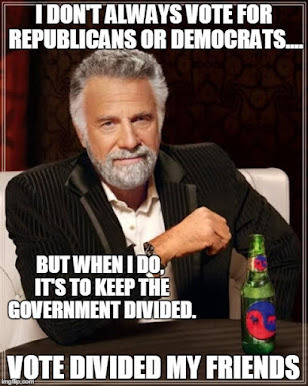 It just requires some of us to always vote for divided government. It's a simple fact that, in the modern era, U.S. voters select divided government far more often than not. That's just math. The big unanswered PoliSci questions are Why do Americans vote for divided government? and Do Americans vote for divided government consciously, strategically, and with deliberate intent? Those are really interesting questions, but completely irrelevant to our purpose. Quite simply, our mission here is not to ask why Americans vote for divided government but to convince a few good voters that they should always vote for divided government. To that end, we found the shiniest object of all - some really great new research. Professors Lacy, Niou, Paolino and Rein save the day with scholarship that documents a practical solution to reinforcing our constitutional checks, balances, and separation of power. "Measuring Preferences for Divided Government: Some Americans Want Divided Government and Vote to Create It"
Well... Yeah. 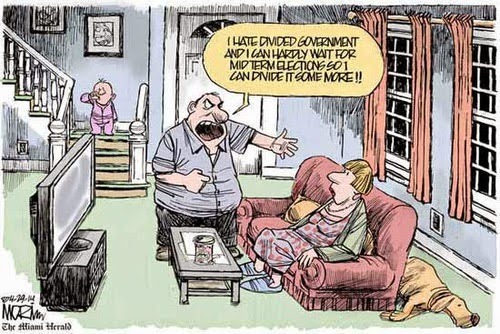 Of course the Dividist knew that "some Americans want divided government and vote to create it", because the Dividist is an American who always votes to create it. But the Dividist didn't know that there was anyone else out there who voted like that. The Lacy, Niou, Paolino and Rein scholarship not only posits that dividists exist in numbers, but quantifies them as a percentage of the electorate. "Tests of theories of the electoral origins of divided government hinge on the proper measurement of voter preferences for divided government. Deriving preferences for divided government from voters’ ideological positions or responses to the standard American National Election Studies question inflates estimates of the proportion of people who prefer divided government. We present two alternative survey measures of preferences for divided government and evaluate the measures across multiple surveys. We find that the percentage of voters who prefer divided government is smaller than previous studies suggest. Voters who prefer divided government according to the new measures are significantly more likely than other voters to vote in ways that create divided government in both presidential year and midterm congressional elections." where E(OjPe; Pl) represents the expected outcome of government policy conditioned on ideological positions of the parties in control of the executive and legislature, Pe and Pl represent the ideological location of the party controlling the executive and legislature, respectively, and e + l = 1... Voters located just to the right of the Democrats or just to the left of the Republicans may still have ideal points closer to unified Democratic and Republican government, respectively, than to divided government, but some voters, positioned in a subset of the interval between the two parties, will prefer at least one form of divided government." "Using these new measures, we find that between 6 and 18 percent of voters, depending on the method of measurement, prefer divided government. One to three percent prefer unified government. The overwhelming number of voters, however, are partisans who should not be expected to support divided government, yet are classified as such by prior measures. These percentages hold across the 2004 and 2008 presidential elections and across state (Virginia & New Jersey) and national elections. Therefore, it is not surprising that studies using prior measures find statistically insignificant effects of preferences for divided government on voting. The newer survey instruments presented here show that far fewer voters prefer divided government than originally believed, but that this smaller group of voters act on their preferences by voting in ways that reflects a desire for divided government and, at the margins, can create divided government in close elections." Thank you! This is exactly what the Dividist has been saying all along. The potential pool of dividist voters are a sliver of the electorate. The numbers are consistent with Cato Studies on libertarianish voters, and other PoliSci research identifying true independents. Because these voters tend to be independent, they tend to cancel each other out. But what this research shows, is that with the organizing principle of voting consistently for divided government, they can become a swing vote that will keep our government divided most, if not all, of the time. And if we keep our government divided, we maintain the integrity of the Framer's intent with Constitutional checks, balances, and separation of power. That is our mission. That is our hope.